aesthetically pleasing, and an affordable alternative to the expensive caskets offered by the funeral industry. 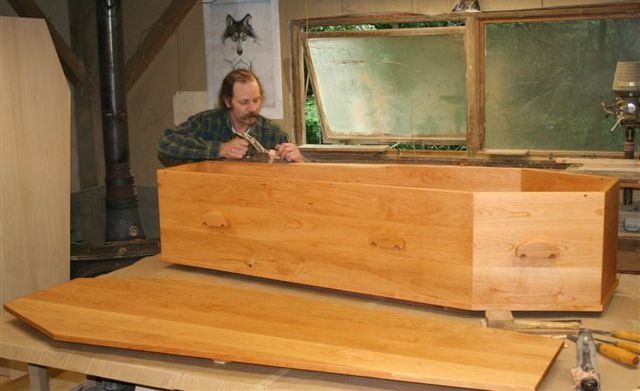 Richard Winter, the founder of the Vermont Coffins, has over 30 years of cabinet making experience. He has utilized his substantial skill in both the design and creation of his line of quality and affordable coffins. Vermont Coffins is a cooperatively operated business located in the heart of north central Vermont. We value serving people who are seeking simpler, more personal alternatives to the current funeral industry offerings. Creating natural products that fill a social need, while strengthening and supporting sustainability in the economy of our local communities are the ideals that form the basis for those of us at Vermont Coffins. “The coffin was amazing! Your work with the wood was perfect and I know my Dad would have been pleased by what you created for him. Thanks again, Peacefully, Lee"
"We are so thankful that you were able to take the time to fill a special order on such short notice. It was perfect! Thank you so much for helping us to fill Dad's last wish. It has meant so much to all of his family and friends. Sincerely, Pamela"
"Richard, It has been a few months since our last contact but I just wanted to send you a final thank you. We buried my Mother in an ancient cemetery in the hills surrounded by old stone walls, and apple trees this week. The coffin you made was really just perfect, and it completed a vision she had for her funeral of love, family and simplicity. My husband commented that the handles you placed on the coffin where perfectly weighted and made the task of lowering it with ropes quite manageable and smooth. We truly appreciated working with you and your dedication to reviving customs of old in an era of commercialization. Warmly, Zoe .....and all of Elizabeth's loved ones"